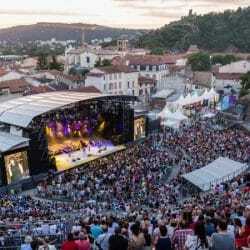 International Summer Festival held in an ancient Roman amphitheatre in Lyon. 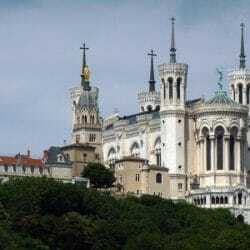 The archaeological site of Fourvière is often considered to be the artistic heart of the city and every summer this 2000 year old Roman amphitheatre located near the Basilique de Notre-Dame de Fourvière and high on a hill overlooking Lyon plays host to a spectacular festival of world-class shows for all tastes and ages including music, danse, theatre and circus. Af the request of Lyon mayor Edouard Herriot, archaeological excavations began on this historical site in 1933 resulting in the inauguration of the Grand Theatre in 1946 with a performance of “The Persians from Aeschylus” by the Groupe de Théâtre Antique de La Sorbonne. The adjacent and smaller Lyon Odeon amphitheatre was incorporated into the festival site in 1952 and kicked off with the Concertos Brandebourgeois, directed by Karl Münchinger. The festival was first managed by the Charbonnières-les-Bains casino, then by the Rhône department starting in the early 1990s and since January 2005 it has been managed by Grand Lyon. 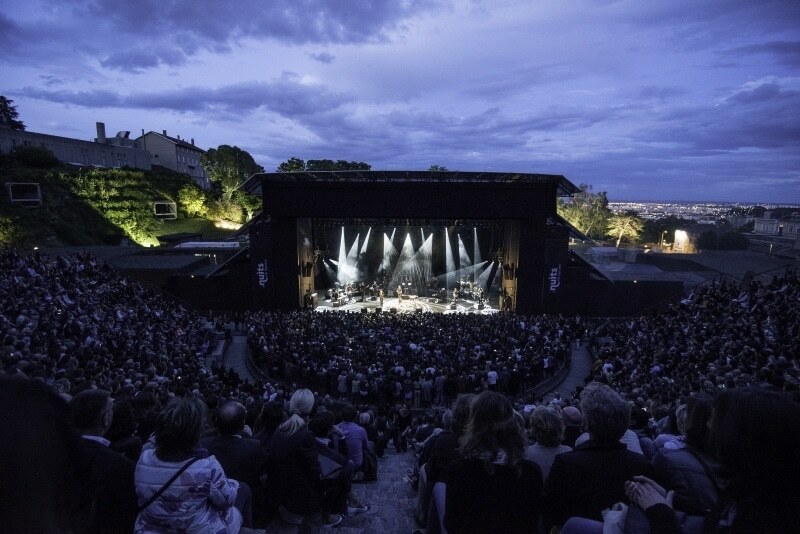 Steeped in history and boasting impressive acoustics coupled with a legendary performer/audience intimacy, the Nuits de Fourvière summer concert series is an unforgettable experience. 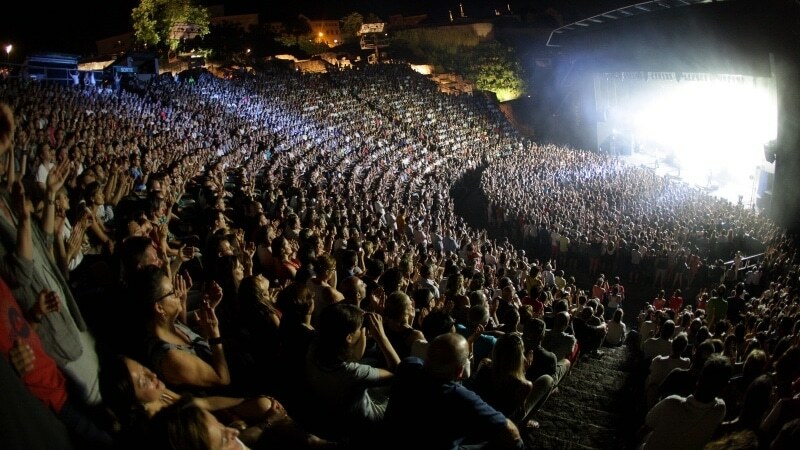 Dedicated to the performing arts and with a multidisciplinary approach, Les Nuits de Fourvière with it’s 4600 capacity Grand Theatre and 1200 capacity Odeon presents around 60 shows every year during June and July to a combined audience of around 130,000 people. Nuits de Fourvière amphitheatre. Paul Bourdrel. The impressive list of past performers is a testament to its popularity among world class artists as one of the world’s premier performance venues. Recent years have seen contemporary music from the likes of Radiohead, Stone Roses, Blur, Arcade Fire and Elton John, theatre productions such as the world premier of Cyrano de Bergerac, classical music Carmen by the Orchestra di Piazza Vittorio and groundbreaking circus presentation Opus which celebrates the music of Russian composer Dimitri Shostakovich. One of the most unique and moving moments at Fourvière is the traditional “throwing of the cushions” whereby at the concert’s close, the audience in their enthusiastic appreciation throws their seat cushions, frisbee-style, towards the stage. It’s a sight to behold and one that surely contributes to the allure of this unique venue especially for the artists performing. Program information and tickets are available from the website or the festival box office located at the entrance to the theatre and open from Monday to Saturday 11am to 6pm. Umbrellas are not allowed so instead bring a waterproof jacket if it looks like rain and seating is unreserved so arrive early to get the best seats. Gates open 90 minutes before showtime. Lyon’s international electronic music festival. Les Nuits Sonores is an electronic music festival held every year in Lyon during the month of May.